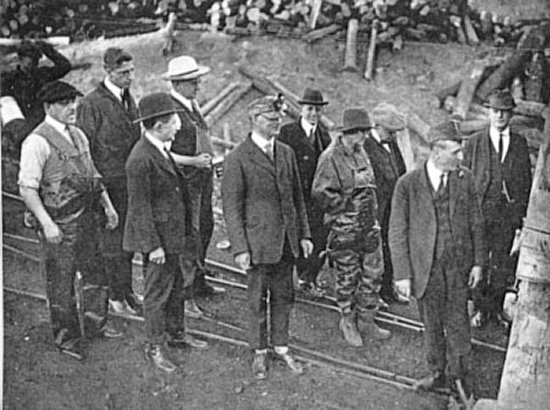 The New York Hirshfield Committee entering a mine, at the Berwind-White Coal Mining Company's coal fields near Windber, PA, October 1922. In the early 1900s, Pennsylvania had more company towns than any other state in the nation. Companies used private police forces, their ownership of housing, and their control of jobs and the courts to impose their will upon their workers and suppress opposition. Unable to win any support from elected officials in the Commonwealth, miners striking against the Berwind-White Coal Mining Company in 1922 travelled to New York City. New York's mayor then sent an investigatory committee, which concluded that "the living and working conditions of the miners employed in the Berwind-White Coal Mining Company's mines were worse than the conditions of the slaves prior to the Civil War."